We are at that time of the year when kids are fantasizing about school being out for summer vacation. Their minds are focused on all of the fun family summer activities that they hope to do this summer. Some may be heading to a family cabin by the lake for the summer. Others may be heading overseas for a vacation. 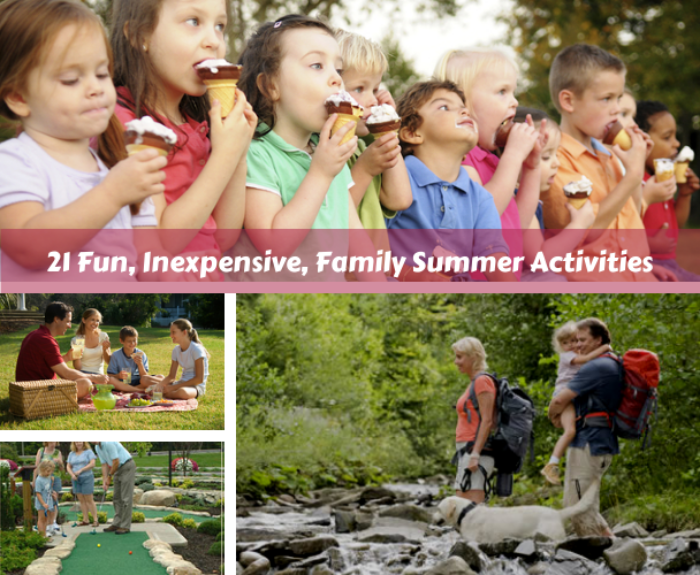 Whether you are staying home with the kids this summer or doing one or two vacations, you will still have days in between and you need to have some fun summer activity ideas close at hand to keep the kids entertained. And yes, it is possible to have fun at home, and keep your kids entertained this summer, without spending lots of cash. 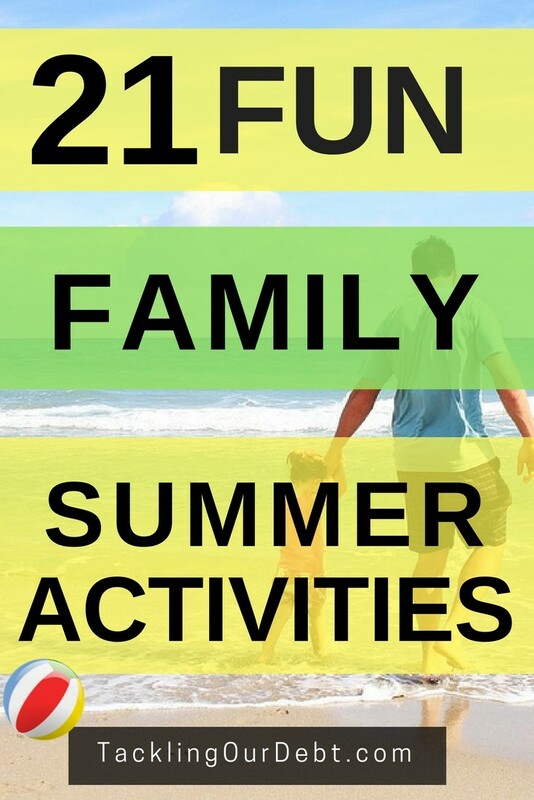 Here are 21 fun and inexpensive activities that the whole family will enjoy doing this summer. Hosting an ice cream social is so much fun. You can do one with family members one afternoon and another one later in the summer with friends and neighbours. Ask everyone to bring a unique flavor of ice cream – at least one gallon or more – and you supply the toppings like chocolate fudge and sprinkles, along with the paper dishes and plastic spoons. Oh, and ask a few people to bring ice cream cones too. Fill a picnic basket with delicious foods that you all enjoy and do a picnic in a local favorite park. Bring a few lawn chairs and nice old blankets along, as well as a Frisbee and a football. Invite friends and family to meet at a local baseball diamond and play a few games of baseball. With a few baseball bats and gloves, you can provide hours of entertainment for lots of kids and their parents. Take the kids to a local tennis court for a few rounds of tennis. Create teams and turn it into a competition. If you live near a beautiful park or close to the mountains, pack-up your gear and go hiking. Remember the camera, and bottles of water. Host a potluck neighbourhood BBQ with hotdogs, chips and sodas. Keep it casual, inexpensive and fun. Do a one day road trip to somewhere fun and only a few hours away from home. The closer to home, the less chance of the kids fighting in the car. Plus, you will spend less on gas by going somewhere closer to home. Do you have space in your front or backyard for a flower garden? Work with your kids to choose flowers and show them how to plant them and maintain them. You can buy plants or you can use seeds. Wildflower seeds are lovely and very cheap to use. How about adding a building element, and making a DIY raised garden bed. As a kid I loved camping in our backyard in the summer with a few friends. You can setup a tent and let your kids spend the night outside or you can camp out with them. It all depends on how old they are. Summer and swimming go hand in hand and it is definitely a fun and inexpensive activity. Pack up the kids and head to the beach or a local community pool for an afternoon of swimming. If your backyard is large enough you could play badminton back there. If not, you could play at a local park or perhaps your local community center has facilities that you could use. Create a family fun night with movies and bake your own mini-pizzas. Buy small pizza shells and your favorite toppings and let everyone build their own pizzas. Have a family cupcake competition. Everyone gets to spend time in the kitchen making their own cupcake recipe and decorating them. And afterwards you can have a tasting event to see who baked the best cupcake. You could even consider inviting a few friends over to help with the tasting and the judging. Just don’t tell them who baked which cupcakes. Do you have a river, lake or pond close by that is filled with fish? Get up really early one morning and take the kids fishing. Balloons are cheap and water is even cheaper. On a hot sunny afternoon have everyone put on their swimsuits and head outside. Grab the balloons and the water hose and begin filling and tying the balloons. Create teams and have a blast with your water balloon fight. If you haven’t gone before, check to see if there is a location in your city that hosts movie in the park night, or concerts. These are so much fun, and all you need to bring is a lawn chair or blanket for each person to relax on. Challenge your kids to a round or two of mini-golf. No one needs to be an expert golfer to play mini-golf and it is always a lot of fun. Nothing says summer like a day at an amusement park or local county fair. Rides to enjoy, games to play and carnival food to snack on. So good!! Spend an afternoon making delicious gourmet chocolates at home. You can find supplies at Michaels Craft Store, and you can find recipes online. Pottery classes have become very popular again, and it is easy to see why. It is a fun and relaxing activity and it definitely brings out the creative side of everyone in your family. This is the perfect activity to enroll your kids in this summer because it is a repeat activity that everyone will look forward to each week.